People seeking sanctuary, including refugees and asylum seekers, are struggling to access health and wellbeing services in Wales, according to a new Public Health Wales and Swansea University report. P eople seeking sanctuary reported feeling their needs were not recognised, and that they had experienced problems navigating through services, including language difficulties and a lack of appropriate interpretation. Some respondents said the stress of being an asylum seeker or refugee contributed to their poor physical and mental health. In a survey conducted as part of the study, nearly a quarter (23 per cent) of respondents said they did not know how to contact, or had not heard of, the 999 ambulance service. 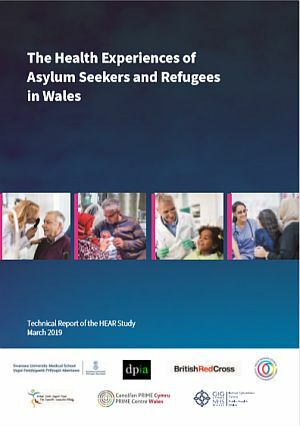 The study – The Health Experiences of Asylum Seekers and Refugees in Wales – was conducted to investigate the health, wellbeing and healthcare experience of adult asylum seekers and refugees in Wales, including the views and experiences of both healthcare recipients and providers. People seeking sanctuary formed part of the research team, and the British Red Cross, Displaced People in Action, Welsh Refugee Council, and the Ethnic Youth Support Team also supported. Health professionals from both secondary and primary care said they often found it difficult to meet the needs of people seeking sanctuary effectively. Issues included a lack of adequate consultation time, a lack of specific knowledge relating to people seeking sanctuary, and a lack of patient information in appropriate languages. “Refugees and asylum seekers make a huge contribution to Welsh society. However, the experience of seeking asylum can be very traumatising adding to existing bereavement, transition, loss and stress. We have a responsibility to ensure that services meet the needs of all in our communities, and that no one is left behind.